Objective: Joe Destructo is a shooting game in the hood with a big fighter named Joe. He is encharged of keeping the city quiet but a band invaded the area and he must get rid of them fast. Explode cars, demolish buildings, do anything you need to keep your equipment good, your body healthy and enemies dead. 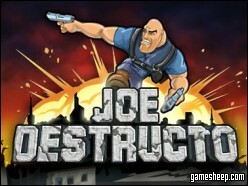 We are glad that you have chosen to play Joe Destructo on GameSheep.com, the most dynamic website available. If you like this game Joe Destructo don't forget to rate it and this way you will help with selecting only the best games for the home page.